COUTURE IS DEFINED AS THE HIGH ART OF SEWING. IT ENCOMPASSES HIGHLY TECHNICAL SKILLS THAT ARE REQUIRED TO CREATE THE INNOVATIVE AND DYNAMIC GOWNS YOU SEE EMBRACE THE RED CARPET. The Couture Design program is a five month intensive program that teaches students to create intricate designs through various hand sewing techniques, understand the appropriate stitches used for couture fabrics, and how to attach feathers, lace, and beading to fabric. By the end of the program, students will have created a gown and bustier. Students MUST have previous fashion design work or education experience for entry into this program. Students should have knowledge in both sewing and draping. Students must hold a high school diploma or GED certificate at minimum. If you don’t have either, ask us about the Ability to Benefit (ATB) test. Students must demonstrate proficiency in English. Our team of educators include professionals from the industry who are committed to nurturing the next generation of designers. 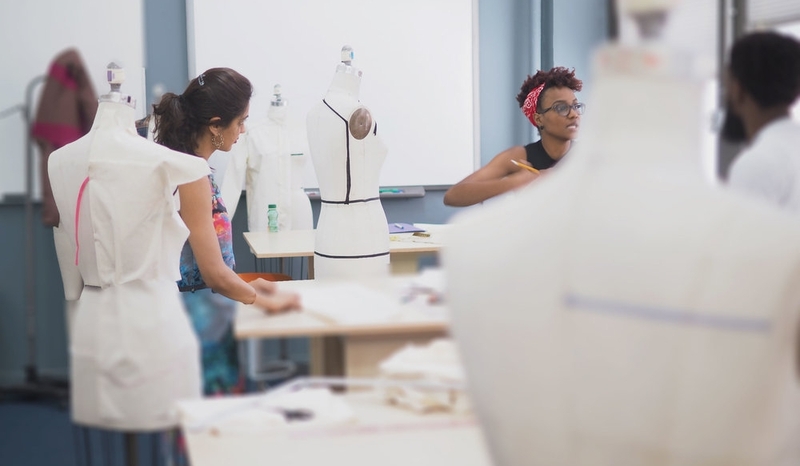 Our instructors for the fashion design program are patternmakers, costume designers, merchandisers, stylists, and fashion designers among many more. You’ll gain industry contacts just by attending class! Many of our students come from backgrounds outside of fashion design and do not know where to begin this journey. That’s where we come in. We provide the support and help lead our students to achieving their goals. By the end of the program, they are amazed at how much they’ve accomplished in such a short amount of time.